Well, here's the final installment of David Werner goodies! This Live record is actually half a Live record only. Side A includes 5 songs off an L.A. show from 1979 and, oddly, side B only adds a weird but fun non-music collage made up from excerpts of several Boston's WBCN programs. I'm guessing David participates or even talks in these radio snippets, but I'm not sure. Any clue you may have will be very much appreciated! The record ends with Too Late To Try from his self titled album. The wonderful quality of his performance leaves you wanting for more, indeed. I can even hear a guy in the audience requesting Cold Shivers. I guess he possibly did it later, but it never made it on this record. Sigh. I agree Popcat...this should have been a full set. I found this is a bargain bin at an old record store years ago. It really leaves you wanting more. Link is correct. You shouldn't have any problem. Thank you so much for doing these! I am a HUGE David Werner fan. I so wish he would make some more music. Howdy popcat, You mention in your blog for this 'here's the final installment of David Werner goodies!'. Any chance of leading me to those previous links? Mega Thanks! 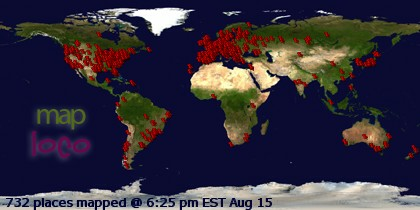 Even for this live posting! Heard this was a radio show. Hi! Well, just check for older posts in this blog. 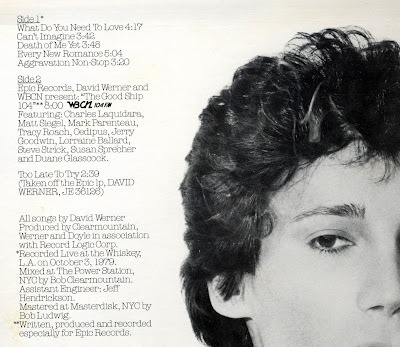 Hey Popcat, I've got a David Werner album I didn't see here. It's titled David Werner. I guess its his third. I'll send it to you if you want it. blog as I wrote in the comments for Whizz Kid. Well, I guess after picking up his second LP from you (BIG THANKS) my David Werner collection is complete. His first album got a lot of airplay on WMMS in Cleveland where I grew up. I was under the impression at the time his first album came out he was from Pittsburgh. Do you have any knowledge on this? I checked out his myspace page after seeing your site and I can't figure out why all this great material hasn't been re-released on CD. I was living in Los Angeles at the time the live thing was recorded, wished I could have attended that show. THANK YOU SO VERY MUCH, FOR THE DW LIVE POST. I'M FROM PITTSBURGH AND HE WAS UNDER RATED HERE. PURE GENIUS. TO BAD HIS SELF TITLED LP DIDN'T PUSH HE TO THE TOP OF THE POP. Have'nt seen him since his concert at the stanley theater in PGH in 1979. I have'nt ran into any of that crowd cosidering I moved to Virginia in 1981. I used to paint churches with his brother Ronnie also. Last I saw of him[Ronnie] was at their Mother's wedding in late 70's anyway a great bunch of freinds there for a while. I loved his first album so much. Anyone have a cd of it? 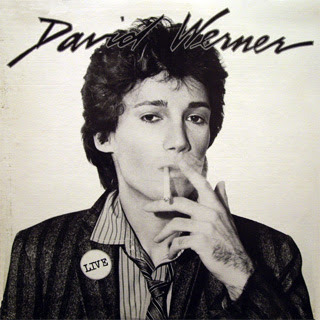 have it on excellent authority all of david werners albums plus unreleased trax will be out in a box set this summer !